National Volunteering Week ends today. Here Donnacha Maguire, who is in Ethiopia, tells us about some of the work being done by Irish volunteers in the country. ARRIVING IN ADDIS Ababa, the capital of the Federal Republic of Ethiopia on Sunday morning last was a real eye-opener. My first time in Africa coincided with the end of the Ethiopian Easter festival and a reawakening of this bustling and energetic city. 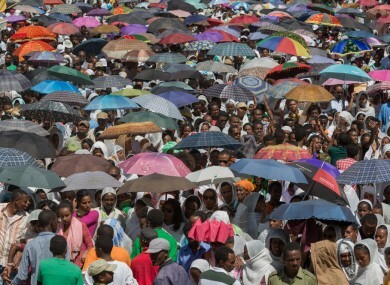 The only African nation to have never been colonised; the Ethiopian people are proud, resilient and eager to build a better future for their communities. Travelling around this landlocked country meeting Voluntary Service Overseas (VSO) volunteers is an absolute privilege for me. My role in the recruitment of international volunteers means that when they depart for their placement the connection can be broken. These people are ordinary Irish people doing extraordinary things in difficult circumstances. They have made a commitment to the partners they work with to share their skills and experiences and begin what VSO calls the ‘Ripple Effect’. The Ripple Effect is the process by which volunteers begin a chain reaction in a local community or even an entire country where capacity is strengthened in a sustainable way. Take Jim Ferguson from Dun Laoghaire who is an Education Advisor in the Ministry of Education for example. With over 40 years experience in English language teaching and education management, Jim is a driving force in the roll out of Education Language Instruction Centres (ELICs) in 66 higher education institutions. Currently travelling around the country training 85 Master Trainers in English Language teaching, his work will reach a combined 43,000 teachers in the next 3 years. This is the Ripple Effect at work. One volunteer addressing a challenge of English language instruction head on and ensuring that hundreds of thousands of children will receive a better quality of education. I started my career with VSO and it was always my intention to finish it with VSO. I know that what I do with VSO will last longer than my placement and that is why I’m doing this. It’s sustainable development that puts people at the heart of the process. Another area where VSO is working in Ethiopia is in the area of teacher training. The number of teachers isn’t an issue anymore. Now the quality of education is the challenge and VSO is committed to up-skilling local Ethiopian teachers with learner centred and active learning focused teaching methodologies. In a way the work I do here is much more difficult than the work I do in Ireland but I’m really enjoying being stretched, sometimes to the limit of my capacity. Personally, life is difficult for me here but the impact I have is so rewarding that it is worth everything to me. Ethiopia has more than enough teachers to teach in schools and universities but needs support to improve the quality of teaching. VSO is doing this by sending people like Aisling to volunteer and to share their time and skills with local teachers. Quality Education is at the heart of what VSO stands for. Our volunteers do not engage in service delivery, ie teaching, which means that they can meet head on the needs and challenges of an entire education system. Our roadmap to success is made possible by volunteers, such as Jim and Aisling, sharing their skills at every level of the education system. Please visit VSO.ie or call 01 640 1060 if you wish to learn more about volunteering or donating to VSO. Donnacha Maguire is the Marketing and Communications Advisor with VSO Ireland and is currently in Ethiopia meeting VSO Ireland volunteers and seeing their impact first hand. VSO is an international development organisation that works through volunteers to fight poverty and the factors that cause it. The volunteers’ work with local counterparts sharing their skills and experiences to build local capacity and to ensure that Ethiopians have the skills needed to transform the country in the way they want it to be transformed. Our vision is a world without poverty, a world where children get a quality education and a world where women don’t fear giving birth. Email “Column: In Ethiopia, ordinary Irish people doing extraordinary things in difficult circumstances”. Feedback on “Column: In Ethiopia, ordinary Irish people doing extraordinary things in difficult circumstances”.